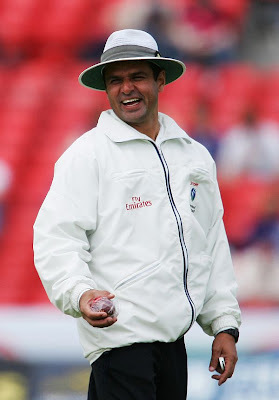 Great Pakistani Umpire Aleem Dar is one again declared the ICC Umpire of the year for third consecutive year by ICC. Aleem Dar is declared best umpire in 2009, 2010 and now in 2011. You will hardly see Aleem Dar doing any wrong decision in his Umpiring Career. He is known for his excellent decisions in all types of Cricket. Aleem Dar has dedicated his award to Pakistani Flood Victims who are suffering hard due to massive rains. Aleem Dar also said that as expectations from him are increased he also feels more pressure when he is umpiring specially during big matches.